If you have looked in every store in your town, combed the internet, and forced your family to look in rug stores while on vacation, we need to talk. Just take a deep breath because we are your answer. We offer professional personalized service as a total rug resource and more. Our owner is qualified by education and years of experience to find or create just the right product for you. LaVerne Williams has a Masters degree in art and in design from Indiana State University. She has professional experience as the corporate designer for a Mid western seven state multi store chain, Corporate buyer for window wall and floor products for Robb & Stucky of Florida, and eleven years as manager and rug designer for Designer’s Rug Center of Naples, Florida. Her design projects have been featured in Interior Design Magazine, Window Fashions Design & Education, Home and Condo, and the home section of Indiana and Florida newspapers. 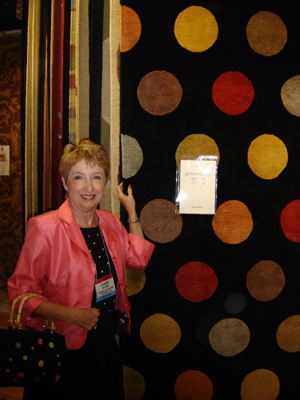 She has participated in rug and window treatment markets throughout America and the Domitex rug show in Germany, and has often presented seminars on rugs and window treatments. As an artist in her own right she has a passion for landscape and wild life art, she is a Parke County Covered Bridge Artist, and she participates in the Covered Bridge Festival each year in Bridgeton, Indiana. She has placed in the Federal Duck Stamp Contest. LaVerne loves people, her work, her art, and cannot wait to meet you.